Fireflies dancing around, hidden from sight, twisting intricate cables in their rhythm, driven to warm the wearer … secretly celebrating with their dance, onwards to warm another. They softly, yet silently swirl around, adding height to the cowl and their intricate wishes of warmth. 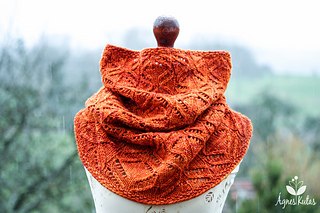 Dancing Fireflies Cowl is worked from the top down in the round. Charted and written instructions. US and metric measurements. The cowl has a relatively high height to add more warmth: it drapes onto itself so that air can get trapped within the layers to provide more insulated warmth. 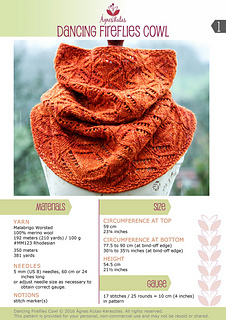 Cowl requires approximately 350 meters (381 yards) of yarn. 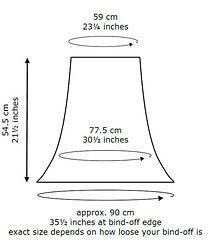 Bottom circumference varies as the looseness of your bottom bind-off can affect the finished size.